All The Live Long Day: Would you lend somebody $25 if it could change their life? Would you lend somebody $25 if it could change their life? Susie from Flower Press had an interesting post yesterday. She supports the online charity Kiva and was asking people to join her in this good cause. Read the story of one of the women she supported here. Kiva is a microfinancing organisation and allows you to make small loans (from $25) to poor borrowers who are working to improve their lives all over the world. Ultimately, it will cost you nothing! You will get paid your money back by them as their lives improve. Then you can either withdraw it from your account or invest in another project. The charity is very community-oriented and helped by different local financial organisations. I love the concept, as I always feel bad for not giving back more to the people I encounter when I am travelling. This is a way that lets me do this. Because of Susie, I have now given two loans myself, and I also wanted to ask you to consider this charity. I thought you might maybe like to join me in giving a hand to a person looking to take their life places? Have a look, I think the idea is great! I decided to loan money to Maria in Mexico, so she can set up her food business, and to Hernestina in Peru, so she can buy more produce for her market stall. You can choose what kind of person you would prefer to give your loan to. Male or female, the country they are from and what type of business they run. I decided on two food enterprises, because, you know, I like food! 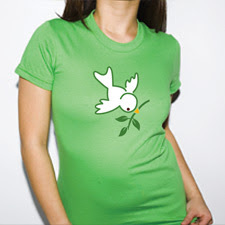 If I can get only 5 of you to sign up to be a lender before 13 August, I will be given the cute t-shirt pictured below. Susie will give hers away on her blog, and I have decided that I would do the same! It is easy to join, just click here. If you do, leave me a comment, and if there are 5 people (or more?!) in the end, I will draw the new owner of the t-shirt from your entries. What a great way to help! I took your advise and made a loan myself. Thanks for spreading the word!